We’ve just got back from Canada (which was properly awesome, and more on that later). One highlight was the chance to visit my friend Carrie, who moved to Vancouver with her other half a couple of years ago and, significantly, gave birth to baby girl twins almost three months ago. I was chatting to another mum-of-twins recently and asked for some tips on what would be a particularly good gift, and after a bit of musing and thinking about the presents which were especial hits for her kids, her advice was effectively “play to your strengths”. Very long-term readers will recognise this pattern. 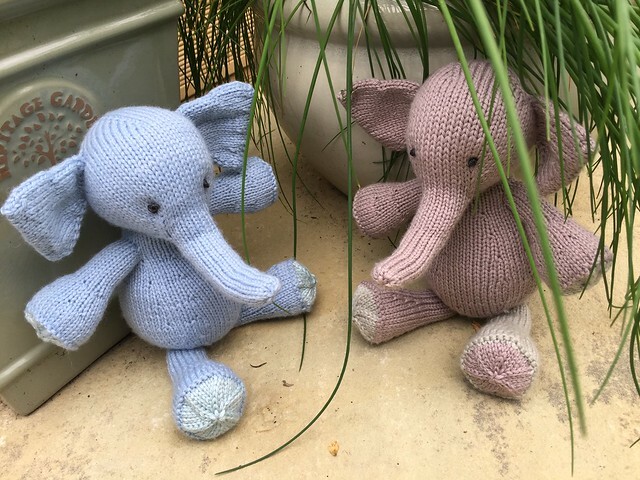 It has become my go-to for baby gifts and I still can’t fault it – knitted baby elephants NEVER STOP BEING ADORABLE. I did spend an hour or two searching Ravelry for other knitted toys but I couldn’t find anything I liked half as much, so a pair of Elijahs it had to be. The yarn (RYC Cashsoft DK) is discontinued now but, given that I’m on a yarn-ban anyway I delved into my stash and lo and behold – two ancient skeins of Cashsoft DK were there! Fate. However: you might note that the little brown Eli has three brown legs with light-green feet and one light-green leg with a brown foot. I knew that one skein of DK isn’t quite enough for a full elephant (this wasn’t my first rodeo) and so fudged it a little by doubling-up some spare Cashsoft 4-ply for his feet. But! I ran out of yarn to do his last leg and I couldn’t work out why. Turns out: at some point during Rowan’s murky Cashsoft past, they changed the yardage (the bastards). The brown skein must be older, and the label tells me it is 115m as opposed to the 130m for the blue skein. So, needs must, and brown Eli has a ‘feature leg’. I love this pattern with all my heart, from the tip of its upturned trunk to the bottom of its pinwheel feet. What is not to like? Those are seriously adorable! I have yet to make a stuffy that resembles a real animal. I have made two Monsters, however, that were huge hits with my nephews. They look so soft! I’m going to go have a look at your link and see if you have the pattern somewhere so I can see how big they actually are. Congrats on such an awesome gift! 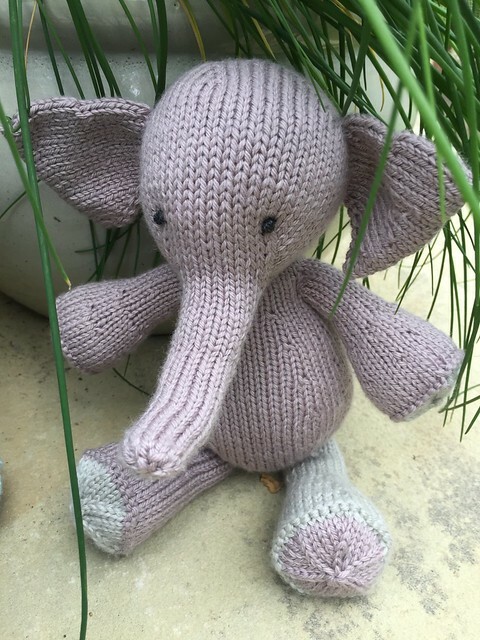 What a fantastic gift, and that is perfect for a go-to knit for new babies. 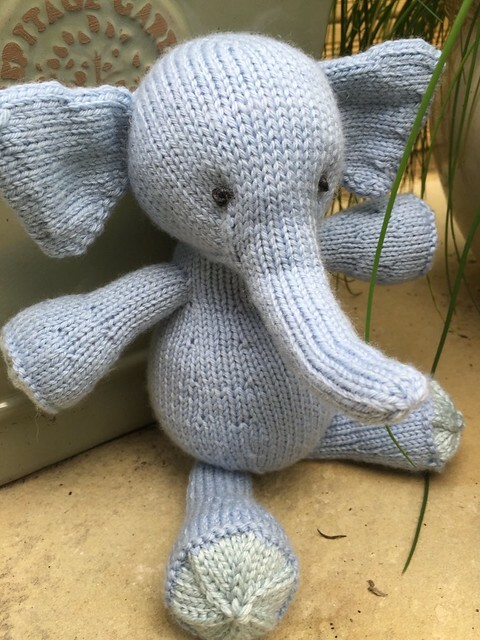 I haven’t knit the little elephant before, but you are making me want to do it! You definitely definitely should, it’s the most fun and satisfying knit! These are wonderful, Kat! They’re so sweet and love how you embroidered the eyes.